You know how I predicted that this book would swallow me whole once I finally settled down to read it? I was absolutely right. I cracked Just Mercy open at page 20 on Sunday and devoured the 300+ pages in the space of about two and a half days. I was a few pages from the end on Tuesday evening when I remarked to my boyfriend, "I'm going to be really glad when this is over, because it's making me depressed." Ugh, yes, I said "depressed" when I should have said "sad." Minus one for Shaina. But it was true—I'd been struggling with anxiety and the blues since coming home from Thanksgiving, and I realized that this book, important as it was, was not doing me any favors in that department. I know, woe is me for being down while reading the devastating stories of dozens of individuals failed by the justice system, in situations I will almost certainly never have to worry about finding myself in simply due to the color of my skin. But, well, it is sad. It's demoralizing. It's wrong, and Stevenson really, really wants us to walk away from his book understanding how awful it gets. "We're supposed to sentence people fairly after fully considering their life circumstances, but instead we exploit the inability of the poor to get the legal assistance we need—all so we can kill them with less resistance." Despite this, Stevenson thinks there's reason to be hopeful. He and his team at the Equal Justice Initiative have won landmark rulings, including bans of life imprisonment without parole for children convicted of both homicide and non-homicide crimes. He doesn't offer us a solution to the prejudice and discrimination that pervade the justice system, but he's determined to keep fighting it regardless. I would recommend this book for anyone looking for a closer, more intimate look at our prison system and the people who inhabit it. As often happens with books like this, the most likely people to pick it up are those who are already interested in social ills and justice, and so the contents may be less shocking and more additional, disheartening examples of a system the reader is already well aware is broken. 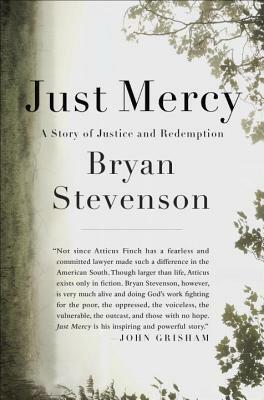 Still, whether you know nothing about the subject or are fairly well-versed, Just Mercy is absolutely worth your time.